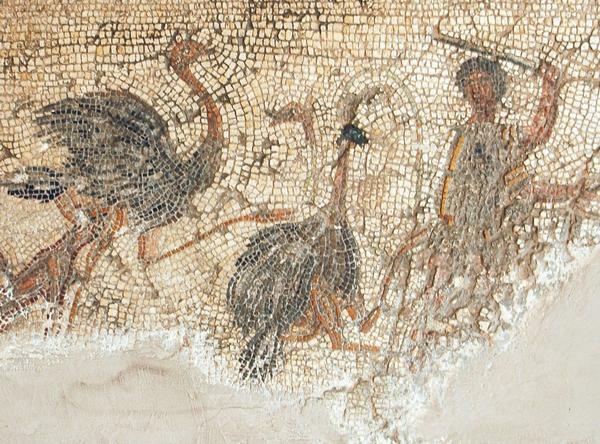 Scene with ostriches, Roman Zliten Mosaic, 2nd century CE. Ostriches were prized in the ancient Roman world, not just as food, but also as pets, work animals and even entertainment. There were no rules and regulations against animal cruelty in ancient Rome and unfortunately, ostriches, among countless other animals, paid the price. African animals, perhaps after the Second Punic War, were brought to Rome where they were featured in the Roman Games. Specifically, they were part of the Venationes games in which wild animals were hunted and killed in the arena, to the delight of the crowd. The great size and speed of these animals made them favorites in the circus. In fact, in 281 AD, the Emperor Probus, in celebration of his victories in war, held a Venatio that featured 1,000 ostriches along with thousands of other animals. For the hunt, the animals were released into the Circus Maximus, which had been made to look like a forest. As food, ostriches seem to have been mainly eaten by royalty. The Emperor Elagabalus, who reigned from 218 – 222 CE, was known to serve ostrich at his royal banquets and even gave them as gifts to visiting dignitaries. At one dinner he served 600 ostrich brains. More commonly the ostrich would simply be roasted and served with a sauce, like the recipe we’re featuring today. Ostriches have long been considered exotic, but today the meat is making a reappearance in markets around the world. 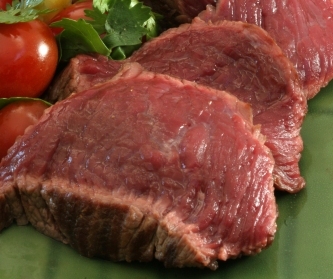 As people turn to healthier food options, ostrich meat is appreciated for its rich protein and iron content while being low in fat, calories and cholesterol. If you want to try this Roman delicacy, it is easiest to order the meat online, although it can occasionally be found in gourmet food markets. The ostrich in the following recipe can be replaced with either turkey or beef steak. Whether or not you decide to take the plunge and enjoy an ostrich steak for dinner, you can delight in the flavors of ancient Rome with this flavorful ragout! Make a roux with the flour and 1 tablespoon of the olive oil, add the passum and continue to stir until the sauce is smooth. Pound together in the following order: the cumin, celery seeds, dates, garum or anchovies, peppercorns, chopped mint, the remaining olive oil, the honey, and vinegar. Add this to the thickened wine sauce. Then stir in the ostrich pieces and let them heat through in the sauce. *See a previous Bon Appetit Wednesday recipe for garum here. Jennison, G. (1937). Animals for Show and Pleasure in Ancient Rome. Manchester: Manchester University Press. Riley, Henry Thomas. The Comedies of Plautus. London. G. Bell and Sons. 1912. Lampridius, A. (2002, January 1). Ingestion / The Life of Elagabalus. Cabinet Magazine. This entry was posted in Blog, Bon Appetit Wednesday, Culinary, Culture, Public Life, Recreation and tagged ancient food, ancient history, ancient recipes, Ancient Rome, AntiquityNOW, Bon Appetit Wednesday, ostrich, ostrich ragout, Roman recipes, venationes. Bookmark the permalink.